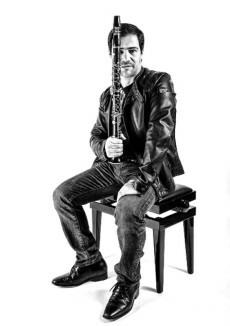 Principal clarinet of the Orchestra di Santa Cecilia in Rome since 2003, Alessandro Carbonare previously served from 1998 to 2003 as principal clarinet of the Orchestre National de France. He has performed as principal clarinet with the Berlin Philharmonic, Chicago Symphony, and New York Philharmonic. He has received awards from international competitions such as the Geneva, Prague, Toulon, ARD Munich, and Paris. Mr. Carbonare has appeared as a soloist with-world renowned orchestras, among them the Orchestre de la Suisse Romande, National Orchestra of Spain, Oslo Philarmonic, Südwestdeutsches Kammerorchester, Bayerischer Rundfunk Munich, Wien Sinfonietta, Orchestre National de France, Berlin Radio Orchestra, and all the major Italian orchestras. Invited by Claudio Abbado, Mr. Carbonare played and recorded the Mozart Clarinet Concerto for Deutsche Grammophon with the Lucerne Festival Orchestra. The album was honored at in 2013 at the 49th Record Academy Awards, presented by the renowned Japanese magazine Record Geijutsu. His other recordings include Alessandro Carbonare, the Art of Clarinet on the Decca label. Alessandro Carbonare also plays jazz and klezmer and is very active in Venezuela’s FESNOJIV, teaching music for free to underprivileged youth in Caracas. Mr. Carbonare is a professor at the Accademia di Santa Cecilia in Rome and teaches summer courses at Accademia Chigiana di Siena.